Hilton Garden Inn Riverwatch in Auburn, Maine. We plan an exciting weekend of educational and fun classes and are happy to extend an invitation to all EGA members and stitchers to join us and experience early Spring in Maine along with the opportunity to enjoy the friendship and camaraderie of like minded people. We are offering 3 classes plus studio time Saturday & Sunday plus a special class on Friday evening which is open to all registrants. Rooms have been set aside at the Hilton Garden Inn www.auburnriverwatch.hgi.com. If you desire overnight accommodations, please contact the hotel directly using the link for a double room (2 queen beds) is http://group.hiltongardeninn.com/Embroiderers ($99 + tax). For a room with breakfast included the rate is ($114 + tax) http://group.hiltongardeninn.com/EmbroiderersBreakfastRate. Breakfast is served in the Garden Grille & Bar and a full cook to order breakfast is offered including eggs, home fries, corned beef hash, bacon, etc. All rooms include Keurig coffee maker, microwave and mini frig. Free Wi-Fi is also included. The same room rates are available before and after Seminar should you desire to arrive early or stay longer. Classes begin at 8:30 am both days. Lunch is from 12 noon to 1 pm. Class ends at 4 pm on Saturday and at 3:30pm on Sunday. Friday evening class will begin at 6:30 pm, this will enable people to arrive and have a light supper prior to class. We will have a Mini Merchandise Mart Saturday prior to dinner where teachers and students will have the opportunity to sell kits, charts, threads, etc. 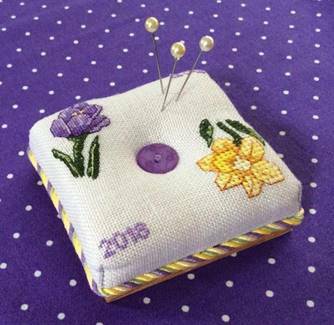 This lovely little piece is entitled “Spring Flowers Pincushion”. It was designed with the counted thread enthusiast in mind. It is stitched on 32 count linen with Anchor floss. It is a petite 2 1/2” square. The pincushion itself is mounted on a piece of wood prepared by Gene Pratt. Several stitching options will be given for stitching the sweet little crocus and daffodil. Students will receive the stitching segment of the piece prior to seminar so that they can get all the stitching completed. In class, students will have fun constructing their pin cushions. 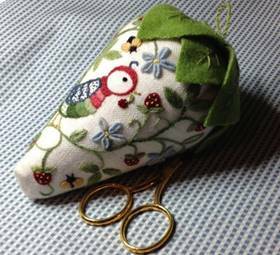 This will include creating the square corners, inserting the filling, attaching the button, making the cording and learning how to attach it, and mounting the pincushion to its wooden base. Many students will complete their pin cushions in class! There will also be an additional piece that coordinates with the pin cushion for students to take home to stitch. But everyone will have to wait until class to see what it is because it’s a SURPRISE! Students to bring: light and magnification if needed and usual stitching supplies. Class description:. Skills learned in the class will be used to make all the toys and the toy box in which to store them. 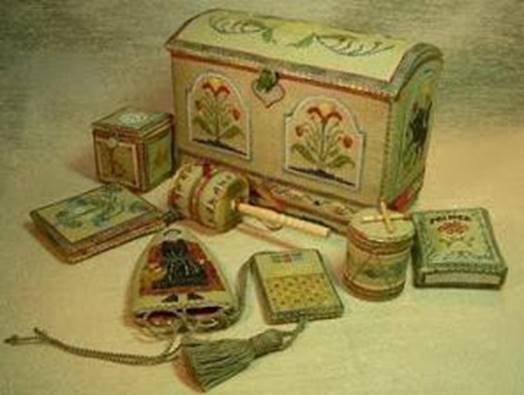 The toys are needlework smalls and include a scissors keep, thimble holder, needle book, waxer box, button box, and pin cushion. More information will be available closer to the event. Kit includes: Linen, flosses, interfacings, finishing supplies, etc. Toy Box Kit Cost $175. Class description: Early English crewel embroidery has a heritage of rich colors and vibrant shading. The exotic flowers and fauna were created using a variety of stitches to create the texture and movement which they relished in their embroideries. It is often mistakenly assumed that everything was “long and short”. In this class students will discover ways of creating the feeling of shading while using a wide variety of stitches or techniques. Besides long and short, we will explore tapestry shading, block shading, Romanian stitch, French knots and raised stem stitch - all good candidates for beautiful shading. The 6” x 6” design is drawn on linen and is inspired by traditional Jacobean patterns. The stitching will be done with both Heathway and Lorikeet crewel wools. Each color in Heathway comes in 9 values and the Lorikeet is slightly variegated – great helps when shading is on the menu. Kit includes: Linen with design pre-drawn, crewel yarns, silk threads, needles, instructions with color photos, stitch guide. both hands are free to stitch. Usual stitching supplies, light and magnification if needed. Strawberries are simple motifs that can be embroidered in a myriad of ways, from soft shading to French knots to darning stitches. 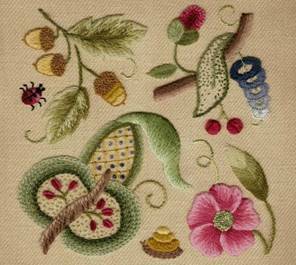 Several examples of berries using different stitches will be provided so students can contemplate how their berries will look in the final results and stitch to their liking. Students will also experiment with different threads and stitches to create a truly original berry vine decorated with an abundance of leaves and buds. Because so many of the threads we are using are variegated, no one’s completed berry will look the same. Felted wool is used for the strawberry cap. There is a challenge in free-hand stitching on the wool but students will learn how to control their background and develop stitches with beautiful tension. Complete instructions (with lots of pictures!) will be given for finishing the actual berry. Kit Contains: Strathaven linen with design pre-drawn, muslin. Heathway hand dyed crewel, Gloriana Lorikeet wool, Florimell silk, Impressions silk & wool, and Weeks Dye Works felted wool. Complete stitch guide with pictures, needles. Students to provide: 10” x 14” stretcher bars (the best method - Evertites preferred) or 8” deep sided wood hoop (wrapped), and preference of a frame stand or weight so both hands will be free to stitch. Basic sewing supplies, including basting thread and dressmaker pins. Lighting and magnification, if needed. Have you been hoping to have some free time to finish one (or more) of your pieces? If you don't need a new project but want to attend the Getaway, then Studio Time is for you! For two days you may sit and stitch with fellow stitchers and catch up on projects. Come take advantage of the collective wisdom and experience of your fellow stitchers! You may still enjoy all the amenities of Seminar and work on whatever strikes your fancy. supplies, light and/or magnification, if needed.